With so much land mass and great outdoors destinations from coast to coast to coast, Canada is a play par excellence kinda place. 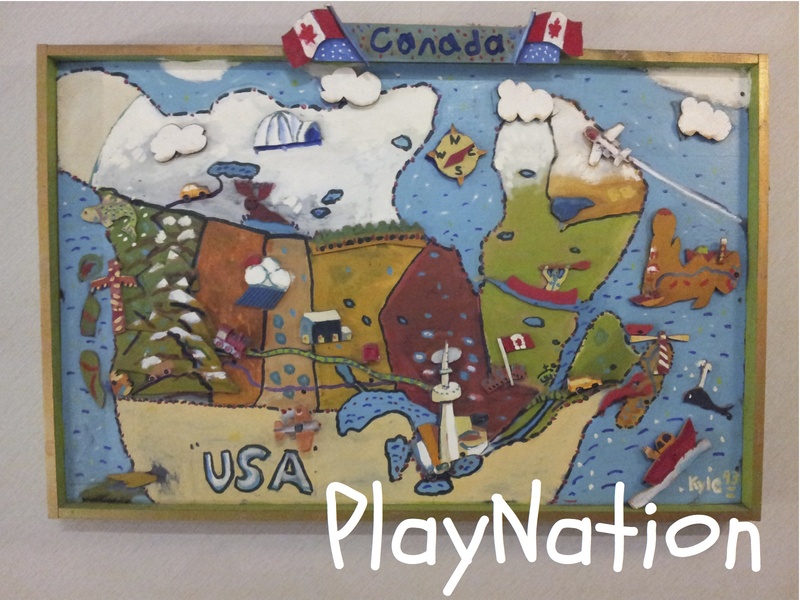 What other G-7 country has a province that’s branded for play? Exhibit A – look no further than Nova Scotia, marketed for nearly 100 years as Canada’s Ocean Playground. This Canada Day post kicks off a series that will run throughout July. Posts will present snapshots of various aspects of play in a country where 16% of the population, some 5.8 million people, are 14 and under. First on deck is Playable Spaces. Subsequent posts will look at Designers and Builders, Researchers, Back in the Day and The Brits Are Coming. On the eve of modern Canada’s 150th birthday bash, here are a few play spaces that possess a certain je ne sais quoi, a distinctiveness that raises them above the crowd. This is a small representative list by no means exhaustive. Some other fine playground folk – the Playground Writers of Canada – have compiled a collection of 150 playgrounds across the country. If you haven’t seen it yet, you can find it here. As PlayGroundology is headquartered in Nova Scotia we’ll start by dropping in on the communities of Middle Musquoidoboit and Meteghan. 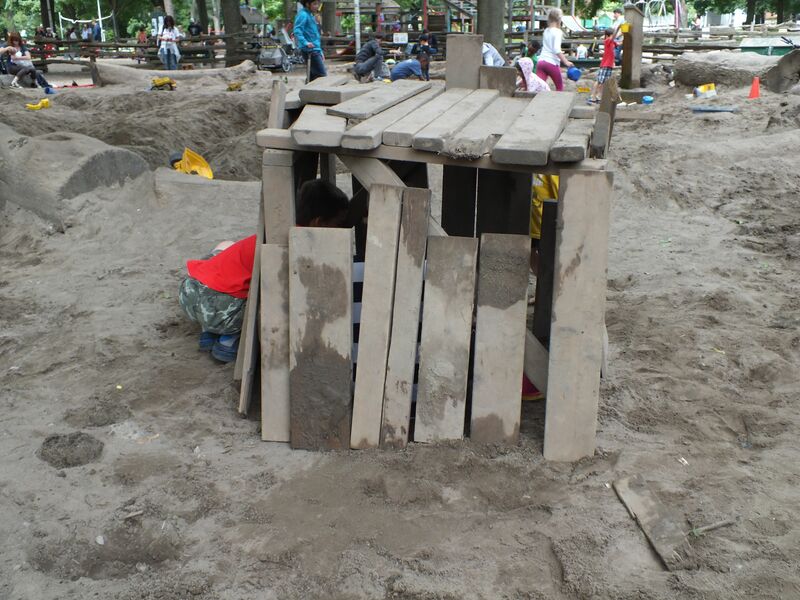 This clip of mud kitchen madness captures opening day at the Nature Play Space in the summer of 2016. This space was created by staff from the Natural Resources Education Centre which is part of the Province of Nova Scotia’s Department of Natural Resources. Two members of the Centre’s team were introduced to natural playgrounds at a conference and were inspired to create something similar. Kids and educators now have access to an innovative resource that’s full of fun. The mud kitchen was an unanticipated feature until women in the local community gathered up all the pots, pans, sinks and other implements and whisked them secretly into the play area prior to the grand opening. On that day there were a lot of kids who had no difficulty discovering their inner muddiness. A local contractor, Garnet McLaughlin of Cobequid Consulting, donated significant time that was instrumental to making the project a reality. 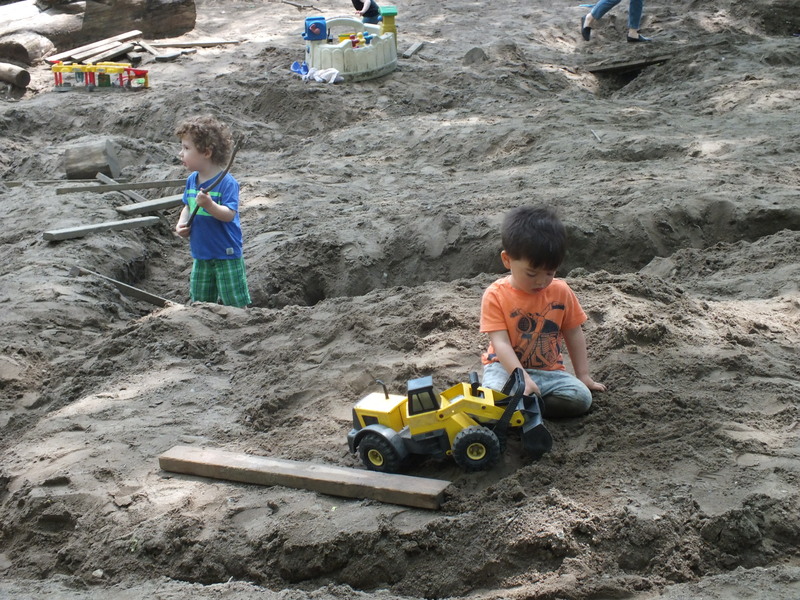 More on the Middle Musquoidoboit Nature Play Space including photos here. On Nova Scotia’s French Shore, three hours and change away from the natural playground, is an enchanted play zone, a repurposed old school building and its grounds. This one of kind play space features locally designed and crafted equipment. 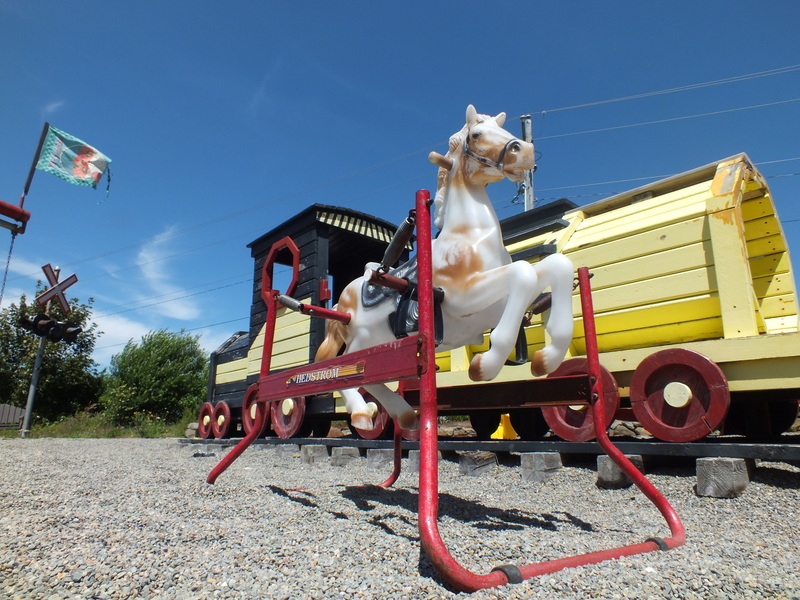 I’m sure it’s the only play space in Canada, if not the world, where a kid can be part of a landscape that pits a spring loaded rocking horse in a race against a hand built wooden locomotive. I spoke with two women the day I visited who were there with their toddlers. They regularly drove nearly 50 kilometres from Yarmouth because they enjoyed the space so much. There are funkly slides, zip lines, windmills, trains, buoy laden monkey bars, suspended fishing nets for scrabbling and climbing and a few traditional set playground pieces like swings. Local dentist Harold Boudreau rallied the community to repurpose the space ensuring that it continues to serve children. More Family Fun Park photos here. Out in the Gulf of St. Lawrence on a windswept archipelago of sand dunes and bonhomie are a series of wonderful playspaces fashioned hy hand by community members. They are of the place – play imitating life. 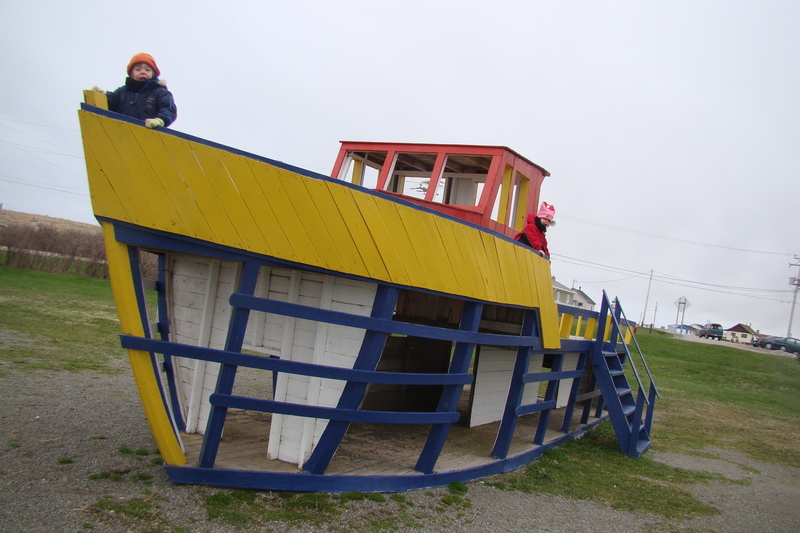 My favourite, and one I return to with the kids each time we visit les Iles de la Madeleine, is a beached fishing boat emblazoned in Acadian colours. This is a great canvas for a living story. The kids run stem to stern. It’s a perpetual movement show with dollops of laughter and snatches of conversation sailing on the wind. Stomping through the wheelhouse and leaning over the bow they look out on their ocean of pretend. For me, I think of this boat as the archetype of iconic vernacular, a space that bursts with here and now and honours the daily rhythms of life. More on les îles… and a few photos too. In a green oasis on Montreal’s mountain, Salamander Playground welcomes kids from across the city. 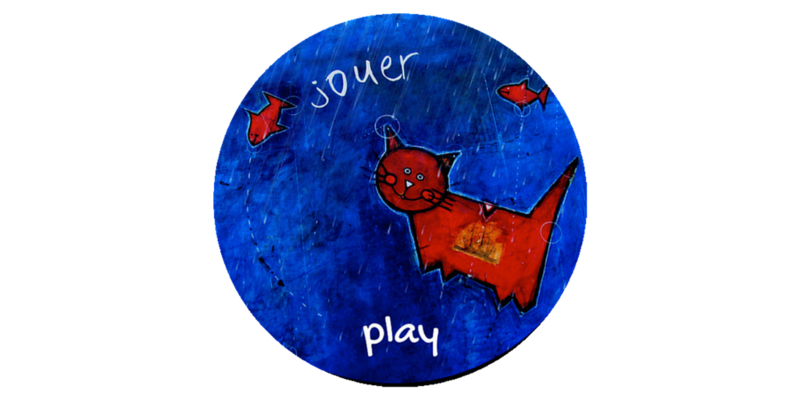 There is a path here with embedded tiled art work by Gérard Dansereau that speaks to the rights of the child. The equipment is of a decidedly distinctive European design. Strathcona’s Folly is tucked away in a park in Ottawa’s Sandy Hill neighbourhood overlooking the meandering Rideau River. It is a distinctive playscape, as unusual as it is unorthodox. Only two elements are of the standard playground ilk. A bronze dipped body of a springrider rooster perches atop a column where only the most adventurous would attempt to saddle up. At ground level sand fills the space. These grains of time are constantly rearranged by wind, little hands and feet, permeating everything, drifting into the cracks, crannies and crevices. 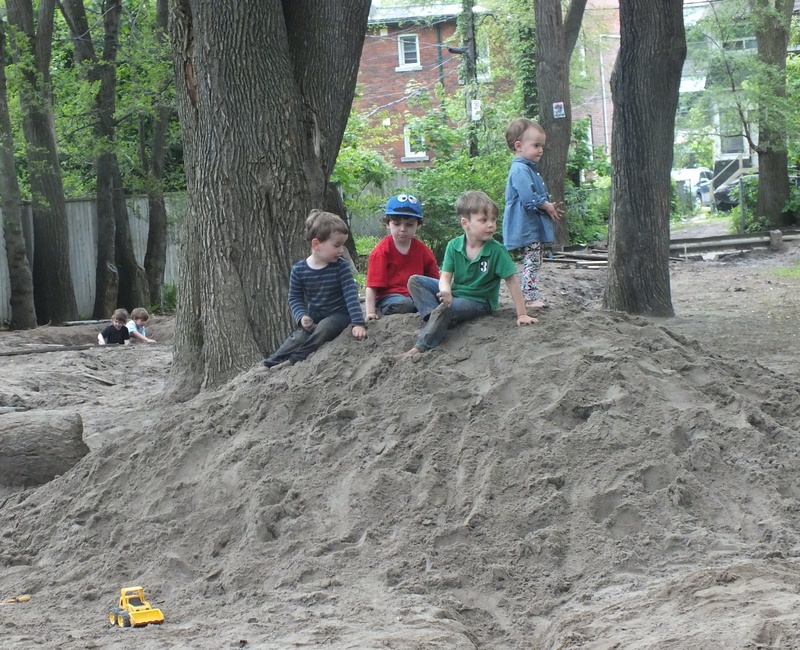 If a kid could design a place to play it might very well look like the ginormous sandpit in Toronto’s Dufferin Grove Park. It’s big enough for mom or dad to mount an expedition when junior gets lost, well not quite that big. On hot summer days, under the shade of the maple canopy, the sand is comfortably cool between the toes. There are dumptrucks, planks of scrap wood for making shelters, full size garden shovels and the plastic beach variety, pails and sieves and a tap for running water. Yes running water to the absolute delight of all the kids – a chance to get dirty and wet, double bonus. Oh and did I mention, this is one of my granddaughter’s fav spots to visit and play. She’s not alone. 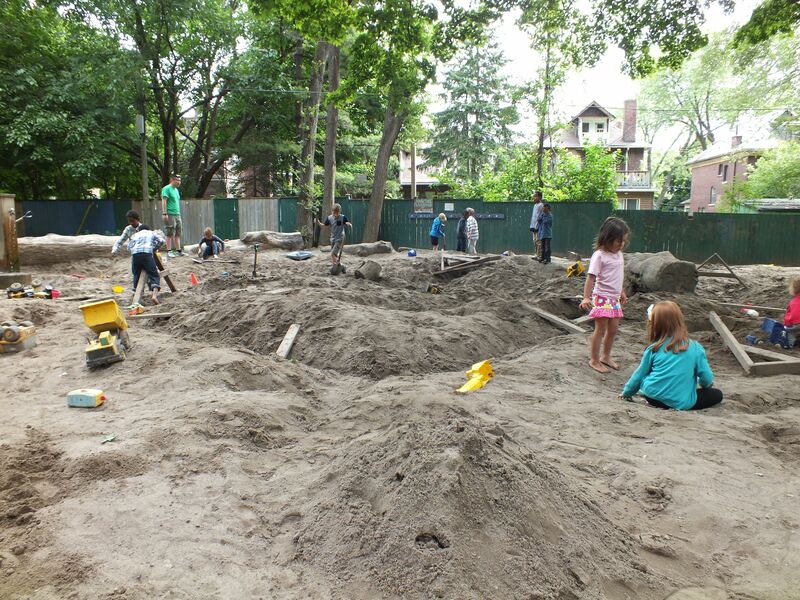 This is a destination play space for Toronto parents in the know! I’m looking forward to next month when Mr. PlayGroundology, aka grampa, and granddaughter will be able to get messy together… More here on Dufferin Grove Park including photos. I’ve not yet had a chance to visit the last three playscapes noted below. Each one captured my imagination from the moment I first saw photos online. These are places I hope to visit and play in with my kids. This is Canada’s only play space, as far as I can determine, that has giant balls, nicknamed skittles by park staff, scattered about the grounds. That’s right they weigh about 150 pounds each and replicate the bright colours of the sugary, chewy candy. A couple of years ago, three of the skittles went missing but were returned following a public appeal. The video gives a partial tour of some of the play space’s features including the skittles, water play, a crow’s nest slide and climber and all abilities swings. If you like South African music, you’ll enjoy the soundtrack. Margaret Redmond, president and CEO of the Assiniboine Park Conservancy had this to say in a media interview about the play space just in advance of the park’s opening in 2011. Assiniboine Park Nature Playground photos via Playworks. Nearly 10 years ago, Garden City was a beacon blazing a different trail from the off-the-shelf playground solutions commonly adopted by local governments. As reported in this Vancouver Sun article, the waterway charted new territory for play in public spaces in Canada. 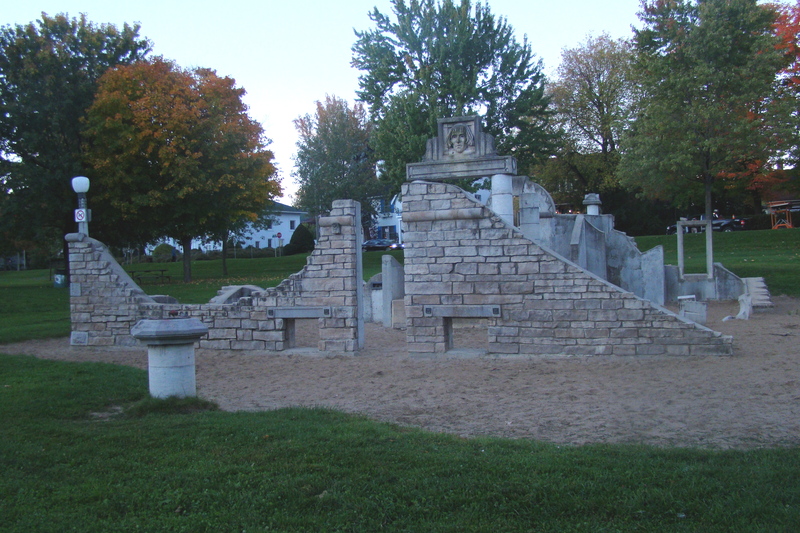 “In what’s believed to be the first park of its kind in North America, it brings to the surface an underground storm water system, and then spirals the water through unusual channels and man-made structures – including a manoueverable sluice, hand pump and water wheel – all of which encourage what Cutler calls child driven ‘interventions”. More here on Garden City Play Environment and a shout out to space2place’s Jeff Cutler for putting me in touch, a few years back, with Cornelia Oberlander, Canada’s doyenne of landscape architecture and a pioneer in playground design dating back to the 1950s. 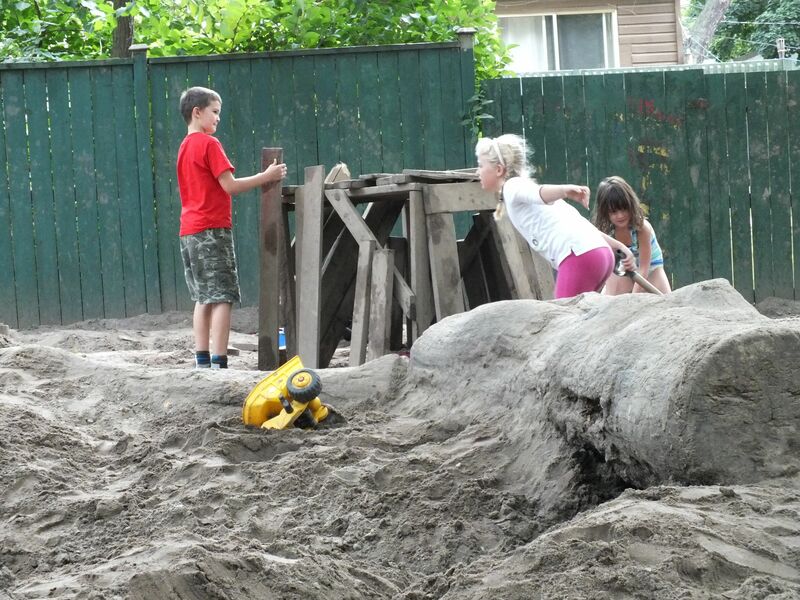 This is a recent design and build by earthscape, the country’s most exciting and prolific playscape crew. 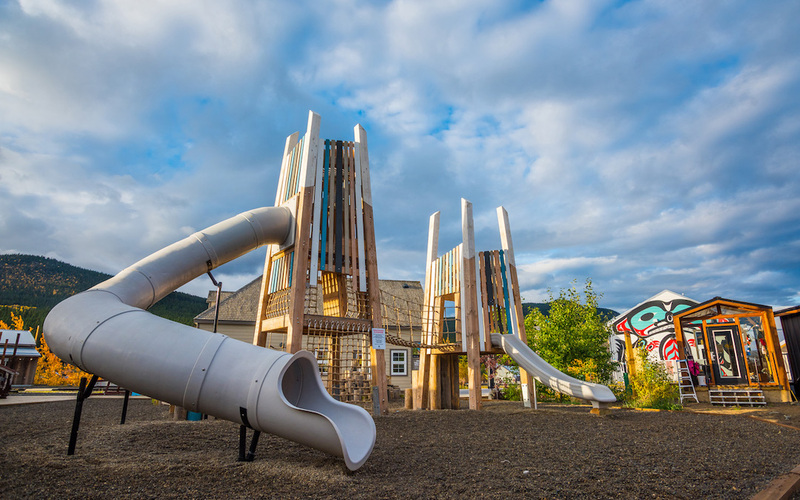 The Carcross Commons play area is set in a stunning landscape about one hour south of Whitehorse. Oh and did I mention that the Duke and Duchess of Cambridge dropped in for a visit last September? More from earthscape here on the Carcross story including photos. Shout outs to the earthscape team who always make time for PlayGroundology‘s inquiries and consistently demonstrate a real interest in encouraging a variety of voices reporting on play. Next up in the PlayNation series – Designers and Builders.